3 Quarters Dead was formed in May of 1999 by original members Mark Alexander, Kenny Wyatt, JP Massengill, Richie Williams,and Waylon Reavis. After gaining local and regional attention and recording their debut album “Blueprint of a Strange Mind” they returned from a tour with Mushroomhead and Avenged Sevenfold to record their second full length album with Skinny (Steve Felton) of Mushroomhead. Waylon Reavis was eventually recruited by Mushroomhead to take the place of vocalist Jason Popson (aka J-Mann) who had announced his departure from the band in mid 2004. After the departure of guitarist JP Massengill and bassist Richie Williams, 3QD started the new and present lineup with Mark Alexander, KennyWyatt, Sam Rhodes, Matt Staley and vocalist Jason Sain. 2008 saw the release of their 2nd full length album “Between Angels and Demons”, recorded by producer Jamie King of “Between the Buried and me” and “The Human Abstract” fame. In 2010 they signed with Independent label “Project Alpha Music” and recorded and released their 3rd full length album entitled “Once Upon this Broken Glass”. The single for “The Unknown” saw a video release nationwide on many local and national channels as well as websites such as Revolver, Spike TV, Clevver, Blank TV, MTV and Fuse On-Demand. 2011 saw 3 Quarters Dead back as independent artists and the recording of their next album “The Cycle of Dust” again with producer Jamie King. “The Cycle of Dust” was released on February 29th 2012 and has gained the attention of A&Rs from Atlantic Records and other labels. 3 Quarters Dead has toured with national acts such as Avenged Sevenfold, Mushroomhead, Nothing face, Switched, Stuch Mojo, Jackyl, Shinedown, Chimaira, Wasp, Snot, Flaw, In this Moment, Powerman 5000 and many more. They have regular air play on 106.5 The End (Clear Channel), 100.3 The Buzz, and many other Internet Radio stations. 3QD has plans to record songs with industry Professional/A&R/Producer Jeff Blue (Linkin Park) of Rock Shop Management in late 2012 for label shopping and A&R development. 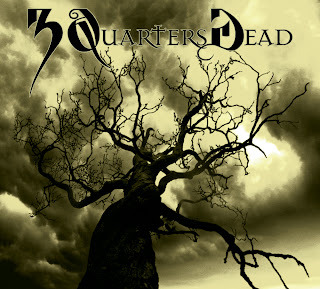 Listen out for Arsenic, Pine Box and Sometime by 3 Quarters Dead on SkunkRadio Live Rock and Indie Playlist Shows.